Director A R Murugadoss’ Kaththi attempts to highlight the pathetic condition of farmers, whose lives are being destroyed by callous multinational corporations, says S Saraswathi. Amidst much controversy, allegations and political drama, Vijay’s Kaththi made it to the theatres, as scheduled, this Diwali. Much to the relief of his fans, all matters were resolved in time and within minutes tickets were sold out in several theatres across Chennai. 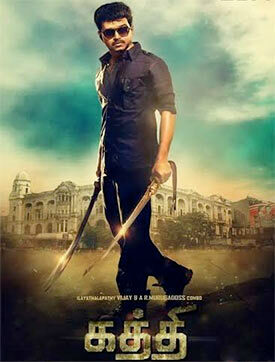 A R Murugadoss and Vijay have proved that they can be a powerful combination. Their previous film together, Thuppakki, was the biggest blockbuster of 2012. The musical brilliance of Anirudh Ravichander kick-started the celebrations a few weeks ago. All the songs became the rage with Pakkam Vanthu and Selfie Pulla becoming overnight chartbusters. Despite the overload of commercial elements, director Murugadoss’ Kaththi brings to the fore a very critical issue. The film deals with the destruction of agricultural lands by powerful multinational corporations, destroying the livelihood of farmers. With no land, no water, no financial resources and drowning in debt, thousands of farmers have ended their lives. Jeevanandham (Vijay) is desperately trying to save his village from being swallowed up by a powerful Cola company belonging to an industrialist played by Neil Nitin Mukesh. Kathiresan (also Vijay) is a petty thief who escapes from jail. Together with his friend Ravi (Sathish), also a thief, he plans to leave the country. But a chance meeting with Ankita (Samantha) at the airport changes his mind. He decides to stick around long enough to win her affections, but gets caught up in Jeevanandham’s fight. Kathiresan witnesses some men shooting at Jeevanandham one night and rushes him to hospital. Though he saves Jeevanandham’s life, he decides to take advantage of the situation by stealing his identity. Jeevanandham is caught by the police and is back in jail. Meanwhile, Kathiresan is mistaken for Jeevanandham and though it is fun in the beginning, he soon understands the gravity of the situation. The rest of the film is all about how Kathiresan eventually saves his village. Vijay plays two totally different characters, excelling at both. Kathiresan, the fun loving Romeo, who can dance, do comedy and effortlessly bash up fifty bad guys, and Jeevanandham, the sedate social activist. Murugadoss has cleverly catered to Vijay’s fans and at the same time maintained some rationale. It’s a decent Tamil debut for the dashing Hindi actor Neil Nitin Mukesh, who in his stylish suits is a far cry from the usually crude antagonists so popular in Tamil cinema. All Samantha had to do in the film is smile and look pretty. This was enough to thrill the audience, who greeted her with wolf whistles in every scene. The camerawork of George C Williams of Raja Rani fame is impressive. Editor Sreekar Prasad could have done away with some of the endless fight sequences and speeded up the first half, which seems totally unrelated to the latter half. Regardless of the excessive masala moments catering to Vijay's mass hero image, the film does convey an important social message. This, coupled with the stunning music by Anirudh, definitely makes A R Murugadoss’ Kaththi worth a watch.